A wise old retired Denali Park ranger once told me that the way you tell if the poop you just stepped in is bear poop is that bear poop has little bells in it and smells like pepper. In my experience with spending time in bear country is that the most important thing to know is being aware of your surroundings. Learn something about bear behavior especially in the area you plan to be in as their behavior does vary greatly depending on where they are, time of year, whether the bears are used to being around humans, and especially if they are mama bears. 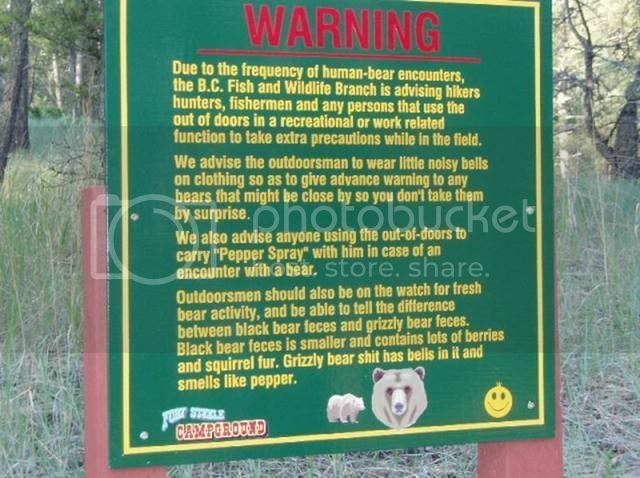 Pepper spray can be a good deterrent for a bear that wants to be deterred. If a bear is determined to get you you may have wasted the few seconds you have to defend yourself with a firearm by using pepper spray. As others have said what ever you choose to use is worthless if you don't have when needed or have not practiced with it. There is a very good course on bear awareness taught by LTR. You wouldn't be referring to this sign, would you, Hog? and I have a good one at Exit Glacier in Juneau too - it says if you are charged by a bear, stop - don't run. However, if it starts to eat you, fight back. Thanks Dakster and everyone else for the feedback. I have hunted all my life but never was big into handguns. Yes, peeper spray is nice but I was speaking of guns! Problem is solved and am glad for the suggestion about the ammo instead of thinking standard 240 gr. hollow points would be a "reliable" load. I've heard that joke, which is funny. Denali by the way has a pretty good record on no bear attacks except that I think a California hiker was killed last year. I did a hiking excursion in the park and the rangers are super paranoid about it - including give you a "bear course for idiots" (and some idiots obviously need it), and a thick plaster container to hold all your food lest the bears get attracted to the food and associate it with humans. We hiked without firearms or bear spray without incident. The plaster container was a pain, I just could not tie it good to my backpack. There was a bear killed a few years ago when it threatened two hikers. IIRC, The year I was in Denali and right after we left, a hiker was killed trying to take close up pictures of a bear.